The rise of plant-based and “cell-cultured” meats has touched off a global debate over what, precisely, constitutes meat. Bureaucrats, consumer groups, and the meat lobby have suddenly become amateur linguists, debating uses and ontologies of the words “meat” and “burger.” Who knew the seemingly innocuous term “rice” would also end up in the crosshairs? Last month, Arkansas Governor Asa Hutchinson signed into law truth-in-labeling legislation sexily titled—all-caps their’s—“AN ACT TO REQUIRE TRUTH IN LABELING OF AGRICULTURAL PRODUCTS THAT ARE EDIBLE BY HUMANS; AND FOR OTHER PURPOSES.” (As for other purposes?) The stated goal of this law is to “protect consumers from being misled or confused by false or misleading labeling of agricultural products.” Much of the law focuses on meat and dairy products, and bars non-animal-derived versions of such foods from using terms like meat and milk. This is similar to legislation passed in at least five other states including Missouri, Wyoming, North Dakota, South Dakota, and Mississippi. But the Arkansas law also protects the term rice. Why? Because the state’s rice farmers are concerned that consumers would be misled by products like cauliflower rice, which do not actually contain any grains of rice. Cauliflower rice is made by breaking down chunks of cauliflower into rice-sized kernels. 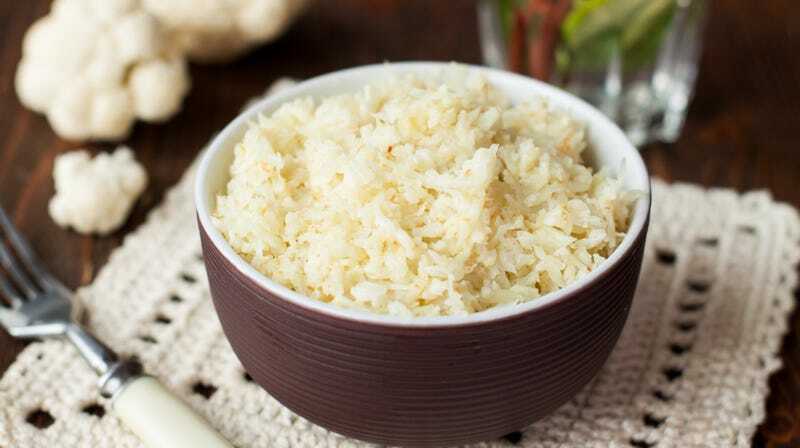 But true rice is now defined in Arkansas as “the whole, broken, or ground kernels or by products obtained from the species Oryza sativa L. or Oryza glaberrima, or wild rice, which is obtained from one of the four species of grasses from the genus Zizania or Porteresia.” Sorry, cauliflower rice, you’re now considered mislabeled. Arkansas Online reports the Arkansas Rice Federation and Arkansas Cattlemen’s Association both had input on this legislation, which will go into effect later this year. One of its sponsors, Rep. David Hillman, is a rice farmer and past chairman of the Arkansas Rice Research and Promotion Board. The law imposes a $1,000 fine for first-offense food mislabeling; funds raised by fines will be directed toward the Agriculture Department’s Plant Board Fund. So now the follow-up question is: What to call the product formerly known in Arkansas as cauliflower rice? Cauliflower Ryce? CauliCrumblies? Fart-Smelling TinyBits? You’re on your own, Razorbacks.